Made of heavy duty 100 mm Square Steel Tube, HOT GALVANIZED for long life. Poles can be detatched from centre for easy transportation and hinged for easy lifting during installation. Easy to bind the poles together with the help of tie bars for sturdiness of the cage. Gates are attached to the poles using four hinges and both gates include wheels for easy movement. NET is 5 mm thick (machine knitted) with 40 mm square mesh. Net is UV stabilized for long life. Steel tube is used on the top of the net to avoid sagging. 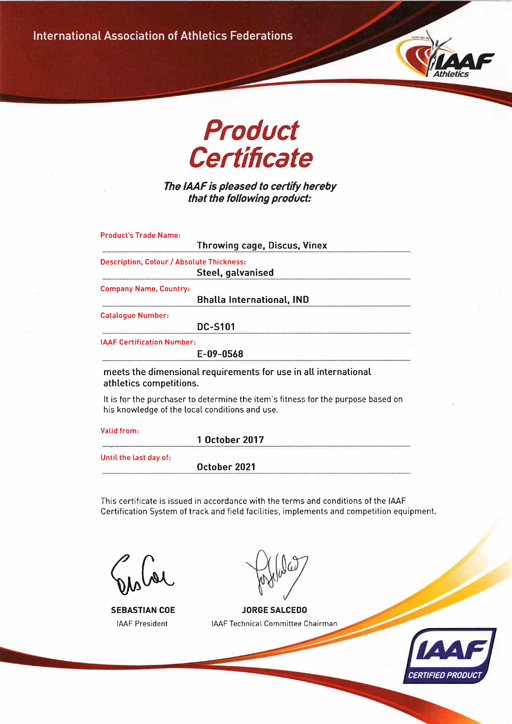 IAAF Approved (View Certificate) , Cage with netting. Made of heavy duty 92 mm Square Steel Tube, HOT GALVANIZED for long life. Poles can be detatched from centre for easy transportation and hinged for easy lifting during installation. All poles are bound together with the help of tie bars for sturdiness of the cage. Machine knitted 5 mm thick net with square mesh of size 40 mm. Net is UV stabilized for long life. Steel tube is used on the top of the net to avoid sagging.